Spain: Day 57 of 985 of the Spanish Civil War. Spain: Day 422 of 985 of the Spanish Civil War. CBI - China: Day 67 of 2,987 of the 2nd Sino-Japanese War. Day 30 of 106 of the 2nd Battle of Shanghai. Day 11 of 70 of the Battle of Taiyuan. Spain: Day 787 of 985 of the Spanish Civil War. CBI - China: Day 432 of 2,987 of the 2nd Sino-Japanese War. Day 93 of 139 of the Battle of Wuhan. ETO: Arrival of first British troops in France officially announced. Poland: Day 11 of 36 of Germany's Invasion of Poland. CBI - China: Day 797 of 2,987 of the 2nd Sino-Japanese War. CBI - Mongolia: Day 124 of 129 of the Battle of Khalkhin Gol. ETO - UK: Day 6 of 258 of the Blitz. 110 killed and 260 injured. Dover suffers worst attack of war. ETO - UK: Day 64 of 114 of the Battle of Britain. East Africa: Day 94 of 537 of Italy's East African campaign in the lands south of Egypt. CBI - China: Day 1,163 of 2,987 of the 2nd Sino-Japanese War. Day 302 of 381 of the Battle of South Guangxi. Day 23 of 42 of the Hundred Regiments Offensive. Russian Front - Finland: Day 82 of 164 of the Battle of Hanko. The Soviets will be forced off their leased naval base. Russian Front - Finland: Day 8 of 28 of Finland's reconquest of East Karelia in southern Finland. The Soviets continue withdrawing from Finland back to Leningrad. Russian Front - Finland: Day 75 of 142 of Operation SILVER FOX, a joint German-Finnish campaign to capture the Russian port of Murmansk in the Arctic. The German troops continue withdrawing back into northern Finland. Russian Front - Finland: Day 73 of 140 of Operation ARCTIC FOX, a joint German-Finnish campaign against Soviet Northern Front defenses at Salla, Finland. Russian Front: Day 82 of 167 of Germany's Operation BARBAROSSA, the overall invasion of the USSR. Russian Front - North: Day 4 of 872 of the Siege of Leningrad. Hitler orders that Leningrad must be taken quickly, regardless of cost. Soviet General Zhukov takes command of city. Russian Front - Center: Day 13 of 14 of the Battle of Roslavl-Novozybkov, Russia. Russian Front - South: Day 35 of 70 of the Siege of Odessa, Ukraine. Russian Front - South: Day 20 of 35 of the 1st Battle of Kiev, Ukraine. MTO - Libya: Day 155 of 256 of the Siege of Tobruk. Middle East: Day 18 of 24 of the Anglo-Soviet invasion of Iran. East Africa: Day 459 of 537 of Italy's East African campaign in the lands south of Egypt. CBI - China: Day 1,528 of 2,987 of the 2nd Sino-Japanese War. Day 6 of 33 of the 2nd Battle of Changsha. ETO: The RAF makes a heavy night raid on Düsseldorf, Germany. Russian Front - North: Day 369 of 872 of the Siege of Leningrad. Russian Front - North: Day 130 of 658 of the Siege of the Kholm Pocket, USSR lays siege to the Kholm Pocket but the Germans hold out for a about a year and a half. Russian Front - Center: Day 44 of 64 of the 1st Battle of Rzhev-Sychevka, Russia. Though it will end in a stalemate, it will keep German troops from going to Stalingrad. Russian Front - South: Day 76 of 150 of Germany's CASE BLUE, the failed offensive to take the Caucasus oil fields. Russian Front - South: Day 20 of 165 of the Battle of Stalingrad, the bloodiest battle in human history. MTO - Egypt: Warplanes of the US and RAF make sweeps during the lull following the Battle of Alam-el-Halfa. East Africa: Day 130 of 186 of the Battle of Madagascar. CBI - China: Day 1,893 of 2,987 of the 2nd Sino-Japanese War. Day 120 of 124 of Japan's Zhejiang-Jiangxi Campaign, launched to punish anyone suspected of aiding the Doolittle raiders in China. Roughly 250,000 Chinese will be killed. PTO - Alaska: Day 97 of 435 of the Battle of Kiska, Aleutian Islands. The US and Canada will defeat the Japanese invaders. PTO - Malaya: Day 205 of 357 of the Battle of Timor Island, a long guerrilla war ending in Japanese victory. PTO - New Guinea: Day 53 of 119 of the Battle of the Kokoda Track. The Japanese continue driving over the Owen Stanley Range toward Port Moresby. This will become an Allied victory. PTO - Solomon Islands: Day 36 of 187 of the Battle of Guadalcanal. ETO: Beginning of Jewish family transports from Theresienstadt to Auschwitz. ETO: US 8th Air Force: B-26s hit two areas in France. Russian Front: German officers captured by the Soviets since the start of the war, form an anti-Hitler association, called the Bund Deutscher Offiziere. Russian Front - North: Day 734 of 872 of the Siege of Leningrad. Russian Front - North: Day 495 of 658 of the Siege of the Kholm Pocket, USSR lays siege to the Kholm Pocket but the Germans hold out for a about a year and a half. Russian Front - Center: Day 36 of 57 of the 2nd Battle of Smolensk, Russia. Becomes a Soviet victory as the Axis are pushed completely away from the Moscow region. Russian Front - Center: Day 26 of 48 of the Battle of Bryansk, Russia. German troops continue retreating. Russian Front - South: Day 19 of 122 of the Battle of the Lower Dnieper River, USSR. MTO - Italy: British 8th Army occupies Brindisi. The US 9th and 12th Air Forces provide the air cover. CBI - China: Day 2,258 of 2,987 of the 2nd Sino-Japanese War. PTO - New Guinea: Day 143 of 148 of the 2nd Battle of Lae-Salamaua. Will become an Allied victory. PTO - Solomon Islands: Day 28 of 56 of the Battle of Vella Lavella. The Allies will win this one. ETO: Patton's US 3rd Army captures a large part of Maginot Line intact and reaches the German border at Trier on the Moselle river. ETO - France: Day 42 of 284 of the Battle of Brittany. ETO - France: Day 28 of 32 of Operation DRAGOON, the Allied invasion of southern France. The 1st French Division occupies Dijon. ETO - Belgium: Day 10 of 62 of the liberation of Belgium. 15th Scottish Division crosses the Dutch border, east of Antwerp. A bridgehead is established across Meuse-Escaut canal. MTO - Italy: US 12th Air Force B-26s hit defensive positions as elements of the US 5th Army pushes through the north Italian mountain passes toward Gothic Line defenses. MTO - Italy: US 12th Air Force B-25s bomb targets at Vigevano and Canneto sull'Oglio. Fighters attack areas in or near Vernio, Alessandria, Turin, Piacenza, and Milan. CBI - Burma: Day 164 of 302 of the Chinese Salween Offensive in Burma. CBI - China: Day 2,624 of 2,987 of the 2nd Sino-Japanese War. Day 148 of 259 of Japan's Operation ICHI-GO. PTO - New Guinea: Day 272 of 597 of the Battle of New Britain. PTO - New Guinea: Day 143 of 481 of the Battle of Western New Guinea. PTO: Forty prominent Japanese are arrested for war crimes. 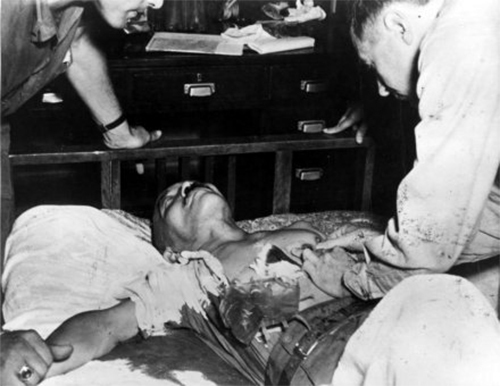 General Hideki Tojo, who ordered the attack on Pearl Harbor, survives a suicide attempt, shooting himself in the chest. General Hideki Tojo was Prime Minister of Japan during most of World War II, from 17 Oct 41 to 22 Jul 44. As Prime Minister, he was directly responsible for the attack on Pearl Harbor, which led to the war between Japan and the United States, although planning for it had begun before he entered office. After the Battle of Midway, with the tide of war turning against Japan, Tojo faced increasing opposition from within the government and military. To strengthen his position, in February 1944, he assumed the post of Chief of the Imperial Japanese Army General Staff. However, after the fall of Saipan, he was forced to resign on 18 July 1944. After the end of the war, Tojo was arrested, sentenced to death for Japanese war crimes by the International Military Tribunal for the Far East, and was hanged on 23 Dec 48. "I am very sorry it is taking me so long to die. The Greater East Asia War was justified and righteous. I am very sorry for the nation and all the races of the Greater Asiatic powers. I wait for the righteous judgment of history. I wished to commit suicide but sometimes that fails."